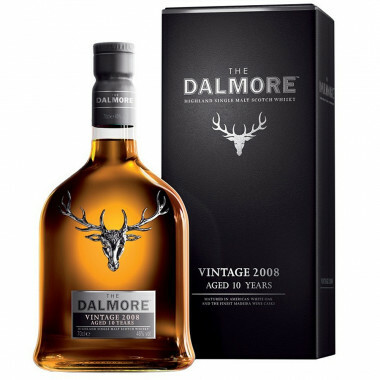 The Dalmore Vintage 2008 is the eighth version of the Small Batches series. It is an exceptional Single Malt with its finish in Madeira barrels. The Dalmore Vintage 2008 is the eighth version of the distillery's Small Batches series whose purpose is to discover the characteristics of unique maturations on the aromatic profile of a whisky. This new expression from Dalmore began its journey in the best Bourbon casks of first filling, before being transferred for a final blooming in Madeira barrels. This maturation of 10 years makes it possible to obtain an exceptional Single Malt whisky. Perfectly suited to the character of The Dalmore, the generous influence of the wood modeled by the Madeira makes a fresh and gourmet whisky. Nose: liquorice, pear and cut hay. Palate: greedy. Apple, nuts and toffee.